A nickname is a substitute for the proper name of a familiar person, place, or thing, for affection or ridicule. It is a familiar or humorous name given to a person or thing instead of or as well as the real name. 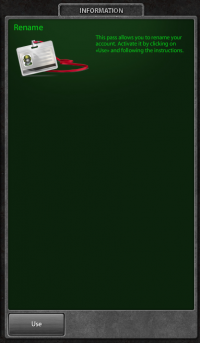 What are nicknames in Tanki Online? They surely aren't simple «substitutes» as stated in the quote above — they represent a user's way of illustrating their personality, things they like or anything that they find funny. 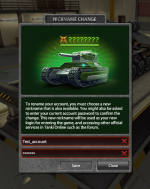 When registering to Tanki Online, each user picks a nickname — there are millions of users currently registered and each one of them has his / her own nickname! 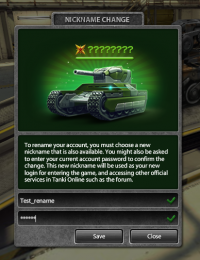 They may refer to famous people, books, films, comics, etc, refer to invented fantasies made by users or even exist only thanks to random pressing keys on a keyboard — what is important to note is that each nickname is part of a user's career in Tanki Online and all his / her friends will address him / her by it! To change your nickname, you must firstly go into the Shop and purchase a Rename Pass. After the purchase, your pass will be in the Garage in the «Special» tab, and can be redeemed at any point to quickly change your nickname. Before making the change, make sure that your new name isn't already taken and it doesn't break the Game Rules. What to do if the nickname you wanted has already been taken? If you tried to register a new account but found out that the nickname you wanted has already been taken, do not despair, you may still be able to get it! For accounts that have been used to purchase crystals, the minimum period of inactivity is extended to 3 years from the date of the last purchase, regardless of the account’s rank. Nicknames of accounts that have been blocked for inappropriate nickname will not become available — these are and will remain blocked FOREVER. if the inactive account isn’t linked to a valid email address, the new user will be able to register / take the nickname immediately. if the inactive account is linked to a valid email address, the original owner of the account will receive an email notification informing him / her that someone wants to claim his / her account's nickname. From that point, the original owner of the account will have ONE WEEK to reactivate his / her account by entering the Game. If he / she fails to do so within that time frame, the new user will be able to register the nickname. What will happen to an account if its nickname has been taken? Even if your account's nickname has been taken, your account WILL NOT be lost! In fact, inactive accounts will simply be renamed to free up the nickname for another user and you will still be able to access your account as usual, even if it has lost its nickname — inactive accounts' nicknames get a prefix «r_» in front of them. So, if the nickname «TANKER» gets taken, the original account's nickname becomes «r_TANKER». 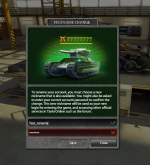 If «r_TANKER» was also taken, then a number from 0 to 100 is added to it, so the name becomes, for example, «r_TANKER0». If you have an email linked to your account, you will also receive an email from our Tech Support listing your new nickname and all details on the process. If you do not have an email linked to your account, you will have to contact our Tech Support, submit a request for account recovery and then wait for their instructions. After all of the above has happened, your inactive account will be given a new nickname. If, after losing your nickname and being given a new one, you decide to return to the game, you’ll be able to continue playing with this new nickname or eventually choose a different one by contacting our Tech Support. NOTE: Nothing you owned will be touched — achievements, garage items, rank, crystals and everything associated with your account before the period of inactivity will still be the same. This page was last modified on 30 January 2018, at 08:49. This page has been accessed 42,308 times.